When I alluded in my last Rum Club Sneak Peak, to September’s Rum Club having a surprise in store, I can’t deny I wasn’t expecting it to be the one we got. Thanks to the range of drinks available through Bibendum Spirits, the latest Rum Club expanded its horizons and also became a sort of Tequila Club and Liqueur Club. With this being at least the fourth tasting of Plantation Rum at a London based rum club this year, I can’t say I was too surprised when Paul McFadyen advised that the only rum he had brought along that evening, was the Plantation Gran Añejo Rum from Guatemala. However in addition to this excellent rum he had also brought along with him both the recently released Pierre Ferrand Dry Curacao and the very smooth El Tesoro de Don Felipe Tequila Blanco. Of course maybe it was having the opportunity to talk only about one rum and the history of Guatemala; the production of rum at Industrias Licoreras de Guatemala and the Solera aging process, that lead Paul to talk for so long in the first place. So following a brief overview of what makes Plantation Rum so different from the rest, with its Cognac style ‘finishing’ of a select number of rums from around the Caribbean, Paul announced that there would be two new rums being added to the existing 13 rums in the Plantation range. Those lucky few that had attended Floridita’s July Rare Rum Club were already familiar with the new 5 year old Bajan and 11 year old Trinidadian rums, each finished respectively in Pineau de Charentes and Banyuls casks. While no specific release date has been given, both rums will be available for general sale, although in limited numbers. We were then treated to a short lesson on the history of Guatemala, starting with the impact of the Spanish Conquistador, Hernán Cortés, on the Central American region with his decree to find gold and convert the locals to Christianity during the 1500s, which culminated in the complete subjugation of the peoples of the region and the formation of New Spain. Following independence from first Spain and then Mexico, Guatemala initially joined together with a number of other countries, before civil war dissolved the Central American Federation in the mid 1800s. Other than a series of dictatorships nothing much happened in Guatemala, from a rum point of view, until the town of Zacapa was created in 1876. However, it wasn’t until 1914 that the town’s significance to rum would show, when Industria Licorera Guatemalteca started rum production. This was followed in 1930, by the family run businesses of Industria Licorera Euzkadi and Licorera Zacapaneca started producing their own rum. These three companies were later joined in 1939 by Industria Licorera Quezalteca before the disruption of World War II on the Guatemalan economy forced these four companies to combine in 1944, forming the Industrias Licoreras de Guatemala distillery. It wasn’t until 1976, when in celebration of the centenary of the town of Zacapa that the name of Ron Zacapa became known with Ron Zacapa Centenario. Today Industrias Licoreras de Guatemala is the only distillery in Guatemala, producing Ron Zacapa, Ron Botran and serveral other liqueurs in the town of Zacapa. 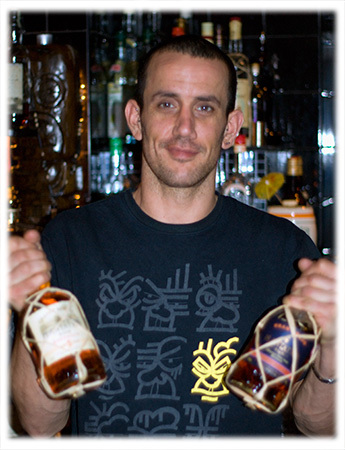 Guatemalan rum differs from many other rums in several ways. Instead of fermenting molasses, they use virgin sugar cane honey, which is fermented for between 48 and 50 hours using yeasts from pineapples. After distillation is finished, using a series of column stills, the distilate is aged using the Solera system in their warehouse, which is nearly 8,000 feet about sea level, where the average temperature is more akin to Scotland than the Caribbean at 16-17 degrees celcius. Industrias Licoreras de Guatemala also differs from a number of other distilleries, in that they use only sugar cane from their own plantations and do not export sugar cane to any other country. With the help of a handout diagram, courtesy of René van Hoven’s Ron Zacapa Part II: Solera System Explained article at www.refinedvices.com, Paul explained the Solera system used by Industrias Licoreras de Guatemala for Ron Zacapa. This process was originally refined by the Spanish for sherry production and while different from the process used in sherry production, in principal it is similar. I won’t repeat the whole description here as Rene has already done a wonderful job explaining it, in detail. So in brief, rums produced using the Solera system have effectively been married during their aging process, by introducing older and younger rums together in the barrels. The oldest barrels are stacked at the bottom, with the youngest barrels at the top, with several different aged barrels between. As the finished rum is taken out of the bottom barrels for bottling, the rum from the barrel above is moved into the older barrel to replenish the removed rum and marry the blend together. This is repeated up through the different younger barrels until the newest barrels are replenished with rum that will have been aged between 12 and 18 months. As no barrel is completely emptied, each barrel will contain a blend of different ages. The time taken to marry the rums together at each stage varies, although if the minimum age of those stages were added together it would total 6 years. Therefore Solera rums contain rums from a minimum to a maximum age. For instance Zacapa 23 is a Solera blend of between 6 and 23 years old. So where does Ron Zacapa come into an evening talking about Plantation Gran Añejo Rum? Well as indicated above, Guatemala has only one distillery, so it shouldn’t be much of a surprise to learn that the Guatemalan rum in the Plantation Gran Añejo comes from Industrias Licoreras de Guatemala and is taken from the Ron Zacapa Solera system. After the finished Guatemalan rum is shipped to France, the rum is then aged for a further 12 to 18 months in Limousin Grande Champagne Cognac casks in the cellars of Cognac Ferrand, where it is tended to and cared for during this time. Before bottling, the Gran Añejo rum has a small amount of aged sugar and aged water added bringing the final bottled strength down to 84 Proof / 42 abv. Plantation Gran Añejo Rum has a sweet caramel and raisins aroma and a sweet start, with notes of coconut, caramel and vanilla before a slightly tempered finish. To say that this rum is very drinkable is no understatement. As easily sipped neat or over ice as it is mixed in a premium cocktail, this is an exceptional rum made even more appealing with low price point for such a quality spirit. Highly recommended and I look forward to putting it through its paces with an upcoming review over the next couple of weeks. 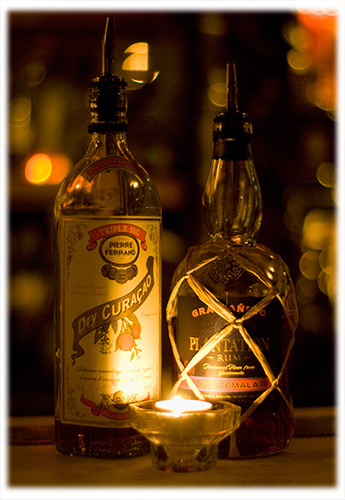 Moving away from the rum, Paul then introduced us to the new Pierre Ferrand Dry Curaçao. Bottled at 80 Proof / 40% abv, this premium Triple Sec is based on a number of old style recipes and was created with Tiki style cocktails in mind. It is produced from Brandy, 10 and 20 year old Cognac’s, Curaçao orange, sweet orange and other flavours. With an aroma of Christmas pudding, it has a sweet orange and complex fruity taste. Although it’s not something I would drink often by itself, this isn’t a reflection on the drink itself, it’s more that I don’t often sip orange based liqueurs. However, I would certainly use it when making premium cocktails and would more than happily add a bottle to my liqueur selection. The last spirit of the evening was the very smooth El Tesoro de Don Felipe Blanco Tequila. Before being double-distilled, the juices extracted from the sweetest parts of the Blue Agave Pina are fermented for a week. Uniquely distilled to bottle strength from different cuts of between 30% and 70%, this fruity highland tequila is bottled unaged at 80 proof / 40% abv, within 24 hours of distillation, allowing it to capture the fresh Agave flavours. With the evening’s presentation over, it was time to ask Damien to experiment with Plantation Rum based cocktails and in particular the new Plantation Gran Añejo Rum. So along with the delicious 5 year old Plantation Grande Reserve Mai Tai that we’d had at the start of the evening, the bar staff put together the following Plantation Gran Añejo Rum cocktails: Mai Tai, Rum Swizzle and Old Fashioned. 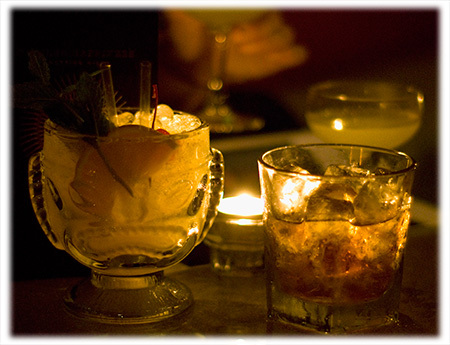 Each of these cocktails benefited from the use of this great rum, which showed its versatility as a premium mixing rum. As always, my thanks to Max and Damien for yet another great Rum Club and to Paul for another great Plantation Rum evening. The next London Rum Club is scheduled for Monday the 3rd October and will be featuring Ron Diplomático, with Declan McGurk of Speciality Brands. For those interested in learning more about the London Rum Club, please either visit the website or pop into Trailer Happiness and speak to the bar staff.